The Dlink DWR-932B is a LTE router / access point overall badly designed with a lot of vulnerabilities. It's available in a number of countries to provide Internet with a LTE network. It's a model based on the (in)famous Quanta LTE router models and inherits some vulnerabilities. The tests below are done using the latest available firmware (firmware DWR-932_fw_revB_2_02_eu_en_20150709.zip, model revision B, /Share3/DailyBuild/QDX_DailyBuild/QDT_2031_DLINK/QDT_2031_OS/source/LINUX/apps_proc/oe-core/build/tmp-eglibc/sysroots/x86_64-linux/usr/bin/armv7a-vfp-neon-oe-linux-gnueabi/arm-oe-linux-gnueabi-gcc). A personal point of view: at best, the vulnerabilites are due to incompetence; at worst, it is a deliberate act of security sabotage from the vendor. Not all the vulnerabilities found have been disclosed in this advisory. Only the significant ones are shown. This router is still on sale. Due to lack of security patches provided by the vendor, the vulnerabilities will remain unpatched and customers with questions should contact their local/regional D-Link support office for the latest information. By default, telnetd and SSHd are running in the router. 2 backdoor accounts exist and can be used to bypass the HTTP authentication used to manage the router. Alternatively, you can fetch it at https://pierrekim.github.io/advisories/quanta-ssh-default-password-admin. Alternatively, you can fetch it at https://pierrekim.github.io/advisories/quanta-ssh-default-password-root. A backdoor is present inside the /bin/appmgr program. By sending a specific string in UDP to the router, an authentication-less telnet server will start if a telnetd daemon is not already running. In /bin/appmgr, a thread listens to 0.0.0.0:39889 (UDP) and waits for commands. If a client sends "HELODBG" to the router, the router will execute /sbin/telnetd -l /bin/sh, allowing to access without authentication to the router as root. Wi-Fi Protected Setup(WPS) is a standard for easy and secure establishment of a wireless home network, as defined in the documentation provided in the router (help.html). An user can use the webinterface to generate a temporary PIN for the WPS system (low probability as the 28296607 WPS PIN is provided by default). You can fetch this program at https://pierrekim.github.io/advisories/quanta-wps-gen.c. Using srand(time(0)) as a seed is a bad idea because an attacker, knowing the current date as time(0) returns the current date in an integer value, can just generate the valid WPS PIN. The Router uses NTP so is likely to have a correct timestamp configured. 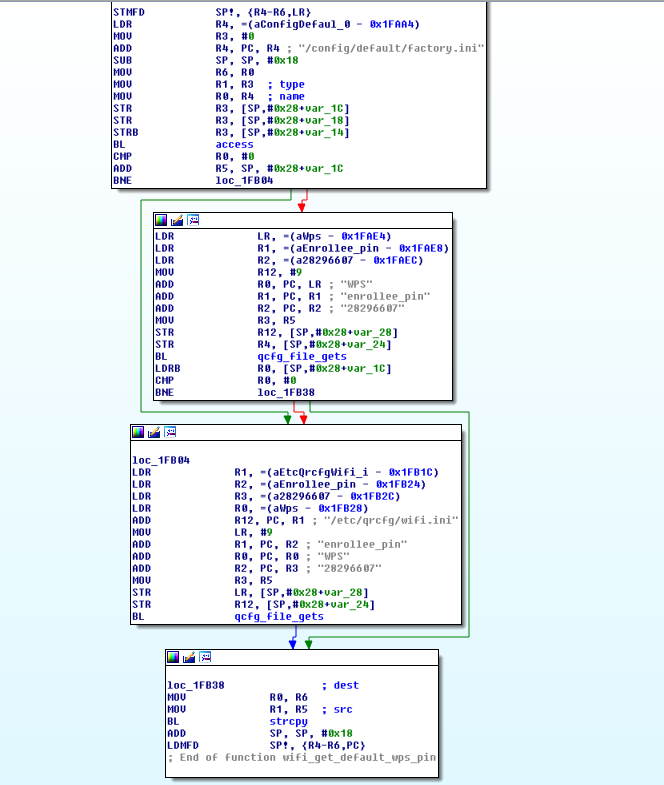 It's trivial for an attacker to generate valid WPS PIN suites and bruteforce them. 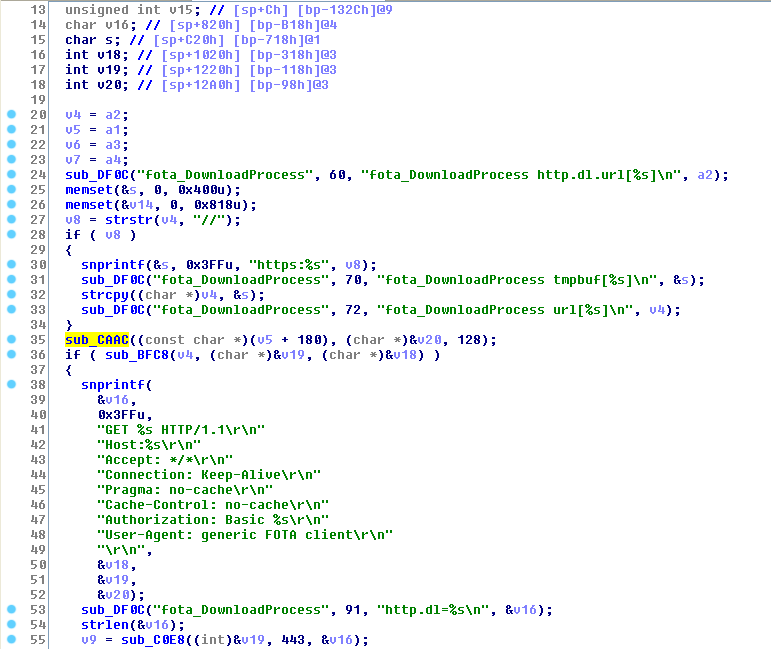 .text:0001B668                 ADD             R0, PC, R12 ; "hostapd_conf_file_gen"
.text:0001B674                 ADD             R2, PC, R2 ; "Get_WpsPin:%in"
.text:0001B688                 ADD             R1, PC, R1 ; "%08lu"
The HTTP daemon /bin/qmiweb is full of vulnerabilities. 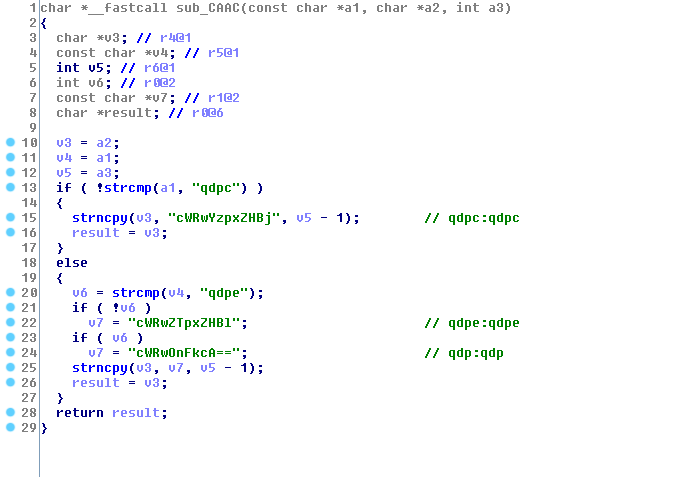 The function sub_CAAC contains the credentials as base64-strings, used to retrieve the firmware. It's notable the FOTA daemon tries to retrieve the firmware over HTTPS. But at the date of the writing, the SSL certificate for https://qdp:qdp@fotatest.qmitw.com/qdh/ispname/2031/appliance.xml is invalid for 1.5 year. echo -n "chmod 777 netcfg"
echo -n "chmod 777 QNetCfg"
I have no idea why the vendor needs to chmod 777 files located in /bin/. UPnP allows to add firewall rules dynamically. Because of the security risks involved, generally there are restrictions in place to avoid dangerous new firewall rules from an unstrusted LAN client. secure_mode=no      # "secure" mode : when enabled, UPnP client are allowed to add mappings only to their IP. # one port in the range. # and to finish the rule set with "deny 0-65535 0.0.0.0/0 0-65535"
In the configuration of the vulnerable router where there are no permission rules, an attacker can forward everything from the WAN into the LAN. For example, an attacker can add a forwarding rule in order to allow traffic from the Internet to local Exchange servers, mail servers, ftp servers, http servers, database servers... In fact, this lack of security allows a local user to forward whatever they want from the Internet into the LAN. As the router has a sizable memory (168 MB), a decent CPU and good free space (235 MB) with complete toolkits installed by default (sshd, proxy (/bin/tinyproxy -c /var/tproxy.conf), tcpdump ...), I advise users to trash their routers because it's trivial for an attacker to use this router as an attack vector (ie: hosting a sniffing tool, LAN hacking, active MiTM tool, spamming zombie). From my tests, it is possible to overwrite the firmware with a custom (backdoored) firmware. Generating a valid backdoored firmware is left as an exercise for the reader, but with all these vulnerabilities present in the default firmware, I don't think it is worth making the effort. Customers with questions should contact their local/regional D-Link support offices for the latest information. Dec 04, 2015: Vulnerabilities found by Pierre Kim in Quanta routers. Apr 04, 2016: A public advisory about Quanta routers is sent to security mailing lists. Jun 09, 2016: Pierre Kim is contacted by Gianni Carabelli about Dlink DWR-932 router's similarities to Quanta routers. Jun 14, 2016: Pierre Kim thanks Gianni Carabelli and says he will contact Dlink. Jun 15, 2016: Dlink is contacted about vulnerabilities in the DWR-932 router (=~ 20 vulns). Jun 16, 2016: Dlink Security Incident Response Team (William Brown) acknowledges the receipt of the report and says they will provide further updates. Jul 09, 2016: Pierre asks for updates. Jul 09, 2016: Dlink says they will have correction by July 15. Sep 12, 2016: Pierre asks for updates and says he will soon release an advisory as 90 days have passed without news. Sep 12, 2016: cert@cert.org is contacted to get pieces of advice about the disclosure. Sep 13, 2016: CERT recommends to try to contact D-link and to publish the advisory. Sep 13, 2016: Dlinks says they don't have a schedule for a firmware release. Customers who have questions should contact their local/regional D-Link support offices for the latest information. support.dlink.com will be updated in the next 24 hours. Sep 28, 2016: A public advisory is sent to security mailing lists. I would like to thank Gianni Carabelli who found this router and thought it was very similar to the previous backdoored Quanta routers.